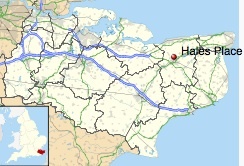 Through some research today, I found that the Hail name and family comes from Hales Place in Canterbury, Kent. At some point, working backwards down the line, Hail becomes “Hale” and finally, “de Hale.” It is a noble name, leading directly to King John I Plantagenet on one side and on the other to Swedish kings. The Hail family emigrated to Massachusetts in the early 1600s, making their way slowly across the country over the next few centuries, before finally settling in California. One of the kings my family is directly descended from is King John ‘Lackland’ I, made famous from the Robin Hood stories. Well, he was a real person, and is being portrayed in the upcoming Robin Hood movie with gladiator Russell Crowe in the title role.